With each year the kitchen furniture manufacturers are trying to bring their collections to the highest possible level of convenience, functionality and aesthetic appeal. Interior designers, in turn, find new color and texture solutions for the finishing of kitchens. An army of professionals working for you and make us able to find and build the kitchen of our dreams – a highly functional, comfortable, beautiful and fashionable space where the whole family will feel comfortable. We hope that the impressive selection of design projects, representing a novelty in design of kitchens, will be useful for your inspiration. We`ve try to gather to upmost examples of the kitchen design latest trends 2016.
often in modern kitchen design projects we can found “unfinished” decoration – brick walls, concrete surfaces imitation. The three main basics which decide the color spectrum in modern kitchen are gray, white and black. Contrasting combinations is the obvious mainstream of kitchen spaces in 2016. This can be seen as variants with a predominance of white (which is quite traditional for kitchens), and completely black kitchen sets or design projects, which represent all shades of gray. 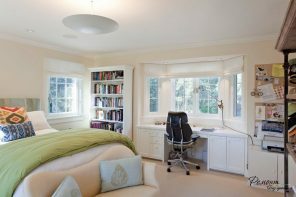 White trim and furniture is the best option to create a visual expansion of space and light, pure image building kitchen of small and medium sizes . Elements of the interior in black (home appliances, countertops in glossy or matt finish, chairs dining area and even the design of extracts) will emphasize the snow-white idyll with maximum effect. A great method to diversify a snow-white kitchen with a cool palette is the use of warm wood tones. Will it be a natural material or an its good imitation (modern materials excellently manage with this role), but the “warming” of the atmosphere of your kitchen is inevitable. In modern design projects we can meet the use of wood picture for façade of both upper and lower tiers of the kitchen cabinets. Black and white colors together with wooden surfaces always look luxurious. You can choose as the base one of the colors and “dilute” it by dozes or equally divide the presence of each of the colors in the interior of the kitchen. Combinations of plain surfaces can effectively diversify black and white ornament pattern of ceramic tiles or the backspash or floor covering. Any housewife knows that the kitchen facades require special attention in the daily cleaning. Even a drop of clean water can be seen on dark surfaces. But aesthetic appeal, incredibly modern appearance and even dramatics of black kitchen unit takes precedence over practicality, and many homeowners become owners of highly original kitchen sets. Of course, for the harmonious integration of absolutely black headset in the kitchen area, it should be big and light – the presence of the panoramic windows or glass exit to the back yard is preferred. Otherwise, you may get very moody, dark, instead of a modern kitchen design. Black kitchen set needs not only bright and airy room, but the bright accents that would be able to raise the intension of the interior, to bring notes of optimism and festivity in design. This may be a bright kitchen backsplash or bar stools, chairs in the dining area of ​​colorful shades. The whole image of the main functional areas of the home will largely depend on how kitchen looks. So, the color, texture and facade pattern in the process of kitchen furniture manufacturing largely determines the style of interior. Modern kitchen sets, as a rule, have a simple and concise form, clean lines and neutral colors. 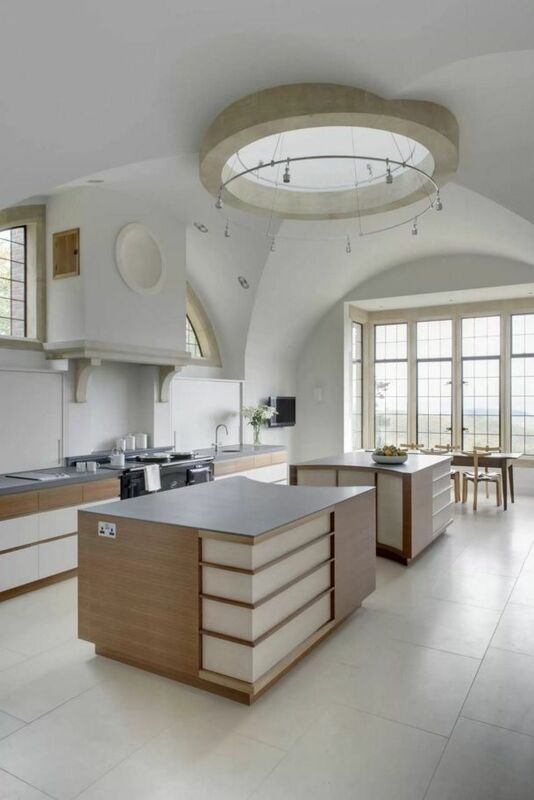 But as any rule, the field of kitchen design has its exceptions. Moreover, modern style does not impose any canons of design ideas to choose from, but only sends the color and design solutions to a given direction. 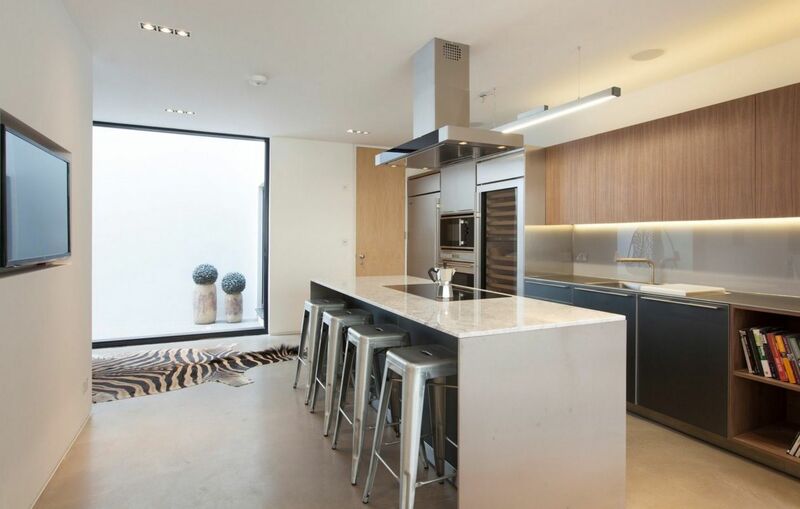 Modern kitchen fronts are often a smooth bright surface, devoid of accessories. Simple and concise solutions, absolutely unremarkable in appearance, hiding a lot of functionality in the depths of their storage systems. The white high-gloss fronts are ideal for kitchens of small size. Not only white, but also shiny surface contribute to the visual extension of small spaces. In the modern interiors kitchen decoration often is a painting in bright colors. Perfectly smooth and white walls are an absolute favorite of the coming season. With white walls you do not have to worry about combinations with color solutions of furniture, home appliances and possible decor. The bright image of the area always leaves a pleasant feeling, airy holiday mood, freshness and cleanliness. 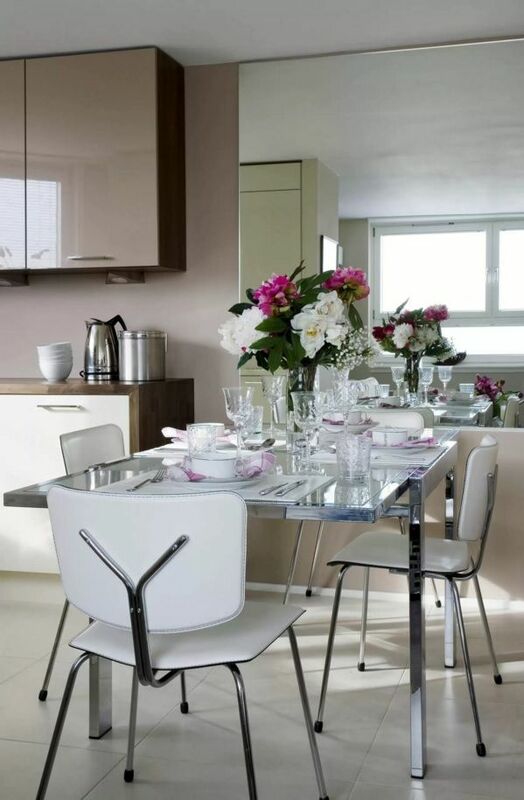 Moreover, against the background of a white finish, even neutral, pastel kitchen furniture will look expressive. Decorating the walls with imitation of concrete textures is the timeless trend for functional premises. 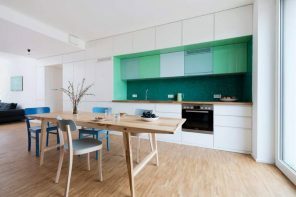 As a rule, for the implementation of this design technique in the kitchen area is often used water-resistant decorative plaster, but liquid wallpaper, paint can be applied either. Masonry is the finishing, which requires the scope. Accent wall, seemingly without treatment, will look expressive in the spacious kitchen. Such techniques bring brutality, industrialism, and sometimes echoes of rural life into the high-tech modern kitchen design. Another way to design the walls in modern kitchen space is the use of wall panels made of MDF or hardboard. Modern panels easily withstand moisture and temperature changes. They are easy to clean and can be used with chemical agents, thanks to PVC film. But we can`t talk about eco friendliness here. If natural material is used for wall facing, we get a safe and the environment facing, but they have to keep an eye of getting moisture on the surface, and keep in mind the high flammability of the material. 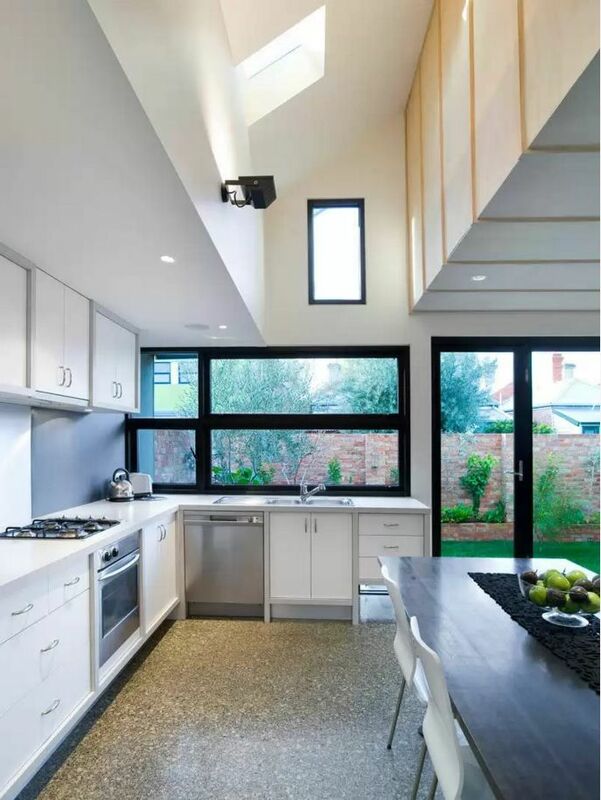 In the modern kitchen design for the ceiling is usually used tension or suspension structures, allowing to achieve a perfectly flat and smooth surface. Find a design project with a non-white color of the ceiling is not easy. The suspension structures often builds a downlights the workers itinerant cuisine. These may be both stationary and rotary lighting models. With suspended constructions you can made two leveled ceiling, to allocate the area of ​​built-in fixtures. Depending on the location of kitchen units and placement of the island or dining area, you can create a local lighting for each functional segment of the room. One of the most popular options for lining floors in the kitchen is to use stone or porcelain tiles. The use of ceramic tile allows to create a reliable, durable and safe coating that will endure the effects of humidity and high temperatures. In addition, the options of color and texture are plenty, you can easily find a suitable flooring to your interior. 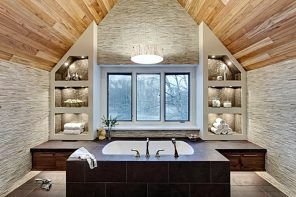 Ceramic tiles can quite successfully simulate wood and stone surfaces. Thanks to modern additives and protective sprays, you can use the parquet flooring, even in areas with high humidity and temperature changes. 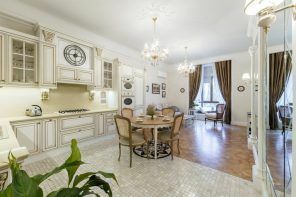 Of course, as the parquet flooring is not cheap, but this finish will last for years and will look luxurious, noble and organic in any design of kitchen space. Due to the improvement of production technology, modern collection of laminate may also face the floors in the kitchen area without any problem. Such the material is difficult to distinguish from natural floor boards externally. Also, cost of such a liner is significantly cheaper and can be laid by homeowners themselves. Backsplash is almost the only element of decoration in the modern kitchen design projects. It can be decorated in bright colors, colorful patterns or colorful ornaments. The use of ceramic tiles in the style of patchwork is a great way to diversify the monotonous and neutral interior of a modern kitchen. Kitchen backsplash, lined with single-color small “Metro” tiles does not go out of fashion for many years to come. You can be sure you spent your money on the veneering ceramic not in vain. Practicality, durability and attractive appearance is provided to your kitchen for long. And all this time you will be able to enjoy the design of the kitchen, which protrudes beyond any style – it is the techniques proven over the years. Backsplash, equipped as a wall storage system of a high level of organization and systematization is an echo of the high-tech style impact to the formation of modern kitchen design. Magnetic holders, hooks and open shelves, shiny chrome surfaces look great on a dark background. Obviously, to set the dining group within the kitchen area, you need to retain an extra square meters after the installation of all the necessary storage systems, domestic appliances and work surfaces. But modern design projects to a greater extent are designed for apartments with improved layout of the kitchen area of ​​private homes of the city or country type, where is shortage of usable space there. In order to embed the dining area into the kitchen of a small size, it is sufficient to use an angular or L-shaped layout of the kitchen units and reject the installation of the island. Corner layout is the universal variant of placing the maximum number of storage systems, work surfaces and appliances in the minimum amount of square meters. A full dining group is an important element of interior design for apartments and houses in which there is no possibility of organizing a separate room under the dining room and the family has more than three people. Dining group, consisting of a large snow-white table and black chairs of original design, looks incredibly organic in the white-black interior of kitchen space. Elements of black gave a snow-white kitchen clarity of lines, constructiveness and dynamic contrast. Bright dining group for the kitchen in light, neutral colors is like a breath of positive and invigorating mood. Just one colorful shade enough to effectively dilute the gray color gamma of the room. Practical and herewith visually appealing way to organize the dining zone in the kitchen area is extension of the countertop of the island or installing a spacious stands from both its sides. With this arrangement, the furniture keeps compactness, but the dining area appears as quite extensive and capacious groups for a large family. Given the desire of contemporary style to the practical and functional minimalism, the decor almost completely disappeared from the design projects of kitchens. As a result, the role of the decor assume functional furnishings – lamps, for example. Considering the abundance of kitchen work surfaces of segments, each of which needs a local lighting, lighting fixtures are located on different levels. Often within the same space you can find two lamps – one for the dining area, and the second covers the kitchen island. Herewith, work surfaces are often equipped with individual lighting built into the top tier of the kitchen cabinets. Cooker hood over the kitchen island with built-in lighting is a frequent design method for modern kitchens, in which stand-alone module becomes a place for the integration of a gas cooker or hob. You can use as one large chandelier, and the whole composition of the small pendant lights to highlight the dining area.